Based on evidence collected in the 1830s, the original earthworks consisted of a rectangular bank enclosure about three feet high, the large, 20-foot-high mound now known as the Jeffers Mound, a smaller mound in the center, and two circular enclosures. The earthworks complex was aligned with the cardinal points and encompassed about eight acres. 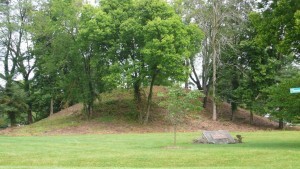 The Jeffers Mound lay nearly centered on the south wall of the embankment. The south wall was shown as offset on the east and west sides of the mound. 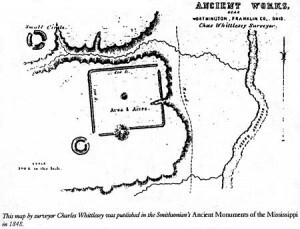 The engraving below shows a map of the complex as it was drawn for Ancient Monuments of the Mississippi Valley, published by the Smithsonian in 1848. William Vining migrated from Simsbury, Connecticut, to Worthington in 1804, purchasing 203 acres of land that encompassed the area now known as the Plesenton subdivision. He and his descendants farmed the land through the turn of the century. Over time, repeated plowings wore down the embankment walls and smaller mounds; however, they could still be seen as late as 1930. Unlike many 19th-century landowners, the Vinings were able to shield the mound from most treasure hunters. However, in 1866, a William Heath sank a shaft from the top of the mound and a tunnel from the east side. He found ash, pottery fragments, two skeletons which were aligned east and west, and many layers of wood. Unfortunately, there is no record of what happened to the artifacts from this excavation. Ohio Historical Society archaeologists Raymond Baby and Suzanne Langlois conducted excavations at the Jeffers Mound in 1978 and 1979. They located a “typical” Hopewell round-corner rectangular structure with double lines of post holes along the north and south walls and single lines (possibly entrances) along the east and west walls. Visitors can trace the outline of this structure by following the painted markers southeast of the mound. Dr. Richard Yerkes of The Ohio State University continued the investigation in the summer of 1985. Dr. Yerkes and his students looked for evidence of domestic activities and/or crafts workshops at the site. If domestic “middens” -prehistoric trash heaps-and other signs of everyday life were found, they would suggest that the Hopewell used the site as a long-term settlement. The team found a few projectile points and other artifacts, but not the confirmation they needed to suggest the site was occupied for long periods of time. Based on the results of 20th-century studies in the area, some archaeologists hypothesize that the Hopewell people visited the Jeffers Mound site, along with other large earthworks in the tributary river valleys of the Ohio River, only periodically. Like similar examples found at other Hopewell sites, the post hole structure at the Jeffers Mound appears to have been only temporary; perhaps such structures were erected as “charnel houses,” places to prepare bodies before burial. Studies at the much larger Hopewell earthworks in Newark and Chillicothe lend credence to the idea that these massive, geometric designs served a ritual or ceremonial purpose, perhaps drawing scattered people from many miles. Dr. Baby’s excavations of two other Hopewell sites near Worthington suggest that a group of Hopewells may have spent part of the year in a settlement located about 2,500 feet west of the Jeffers Mound in Linworth. These people could have been responsible for building and maintaining both the Jeffers Mound earthworks and the Holder-Wright earthworks, another apparently ceremonial earthwork located about four miles northwest of the Jeffers Mound on a bluff overlooking the Scioto near Dublin. It is also possible that people from throughout the upper Scioto Valley came to these earthworks to conduct ceremonies. Unfortunately, the link has broken that would tell us who the Hopewell people were and why they built the mounds. The Native Americans living in the Ohio River Valley could not provide the first European explorers with the answers. No one even knows what name they called themselves; “Hopewell” comes from the name of an early 19th -century Ohio farmer whose land included a large mound of this type. What is known is that the Hopewell must have been a highly organized society to have had the manpower and surplus resources to create such elaborate earthworks. Although Ohio and Illinois were the cultural centers of the Hopewell peoples, their network of contacts covered most of eastern North America. Artifacts from Hopewell burials include obsidian and grizzly bear teeth from the Rocky Mountains, copper from the northern Great Lakes, and shells from the Gulf of Mexico. The Hopewell’s active mound building period was roughly 400 BC to AD 400. Fortunately, the Ohio Historical Society owns a number of major Hopewell sites that are open to the public. The Ohio Historical Society’s museum in Columbus has one of the foremost collections of prehistoric regional artifacts in North America. For more information on Ohio’s magnificent prehistoric monuments and the Native American cultures that created them, contact the Ohio Historical Society. Ever since Charles Whittlesey surveyed this and many other Hopewell sites in the 1830s, the earthworks on the Vinings’ farm have been recognized as an important if mysterious reminder of the land’s ancient past. In 1921, Herman Plesenton Jeffers purchased the land from the Smith family, descendants of the Vinings. When the Jeffers family platted the land for subdivision in 1954, they did not include the mound. In 1974, The Jeffers Trust deeded the mound to the Worthington Historical Society in Herman Jeffer’s memory so that it could be preserved in perpetuity. The Jeffers Mound was listed on the National Register of Historic Places that same year.